We use an evolutionary algorithm (EA) to search the space of leaky integrate-and-fire (LIF) neuron networks, in order to identify network connectivities producing significant rhythmic activity at sub-spiking frequencies (i.e., 'bursting-like behavior'). We find that the connectivities of the most-fit LIF networks exhibit a relatively broad in-degree distribution and a relatively narrow out-degree distribution. We examine the frequencies of connection motifs in the most-fit LIF networks as compared to random networks. In a network of more realistically modeled neurons, the most-fit network connectivities are observed to produce a broader frequency response as compared to that resulting from random network connectivities. 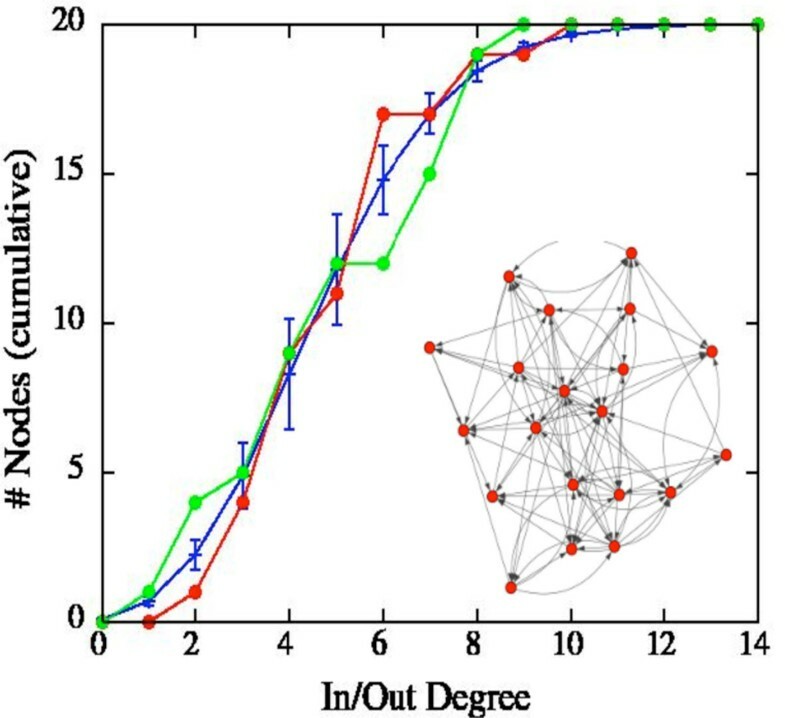 Figure 1 shows the cumulative in- and out-degree distributions of a representative most-fit network, whose connectivity graph is illustrated in the inset. The orange line represents the cumulative in-degree distribution, and the red line the cumulative out-degree distribution. The blue bars represent the expected cumulative distribution (and error bars) for random network connectivities. shows the cumulative in- and out-degree distributions of a representative most-fit network, whose connectivity graph is illustrated in the inset. The orange line represents the cumulative in-degree distribution, and the red line the cumulative out-degree distribution. The blue bars represent the expected cumulative distribution (and error bars) for random network connectivities.